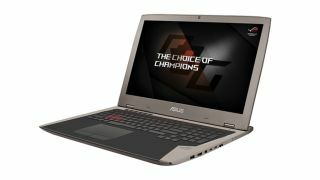 Asus has unleashed a new gaming notebook which boasts a 120Hz display that benefits from G-Sync, and is backed by some blistering hardware including a chunky Core i7 CPU and GTX 1080 graphics solution. It’s on sale over in the US now starting at $3,099 (around £2,500, AU$4,140). Asus says the Rog G701VI notebook is the first in the world to have an IPS panel (for wide viewing angles) which offers a 120Hz refresh rate along with Nvidia’s G-Sync technology to help combat stuttering and tearing, and make for smoother gameplay all round. It’s a 17.3-inch Full HD (1920 x 1080 resolution) screen which is driven by an Intel Core i7-6820HK processor overclocked to 3.8GHz (which you can push further to 4.1GHz if you desire) and twinned with a GeForce GTX 1080 GPU with 8GB of GDDR5X video memory (with the card clocked at 1596/1796MHz). Depending on whether you go for the G701VI-XB72K or G701VI-XB78K, you get either 32GB or 64GB of DDR4-2400 system memory respectively, and either a single 512GB NVMe SSD for the former model, or a pair of these SSDs in RAID 0 with the latter more expensive notebook. These are the only two differences between the two models of the G701VI – all the other specs remain the same. The laptop is 34mm at its thinnest point and weighs 3.6kg. It boasts a built-in subwoofer and speakers, plus an ESS Sabre DAC and amplifier to make the best out of your gaming headphones if you’re going that route. There’s also dual-band 2x2 802.11ac Wi-Fi on-board and in terms of connectors you get a pair of USB 3.1 Type-C ports (one supports Thunderbolt 3) and three USB 3.0 ports. There’s also an Ethernet connector, HDMI port and Mini DisplayPort. You can bag this notebook right now with the G701VI-XB72K running to $3,099 (around £2,500, AU$4,140), and its bigger brother the XB78K will set you back $3,699 (around £2,980, AU$4,940).